Books from Craft & Vision only cost $5. Last week I read David duChemin’s ebook, A Deeper Frame, from Craft & Vision. Normally a book by David is very..well, deep. In this 22-page ebook, he talks about how to create photos with spacial depth in the flat medium of photography. This was the jest of the second assignment we did on Storytelling three years ago. In A Deeper Frame, David explains how to use perspective, seeing in three dimensions before clicking the shutter, using optics, focus, color and light to create depth in photography. The narrative is further enhanced with photographs and graphics which bring his points clearer. 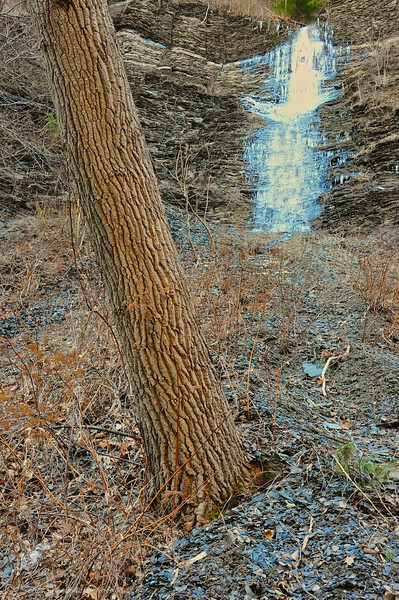 This ebook was fresh in my mind as I photographed at Taughannock Falls State Park last weekend. In this first photo, I looked deeper into the scene to find subjects in the foreground, midrange and background. Can you identify them? Nikon D700/28-300VR, f/22, ISO 200, EV -0.6, 35mm focal length, tripod, HDR image. In this next one, I used a combination of optics and leading lines. The focal length of 45mm cut down the angle enough to lead your eyes from the sign down the path to the waterfalls in the background. 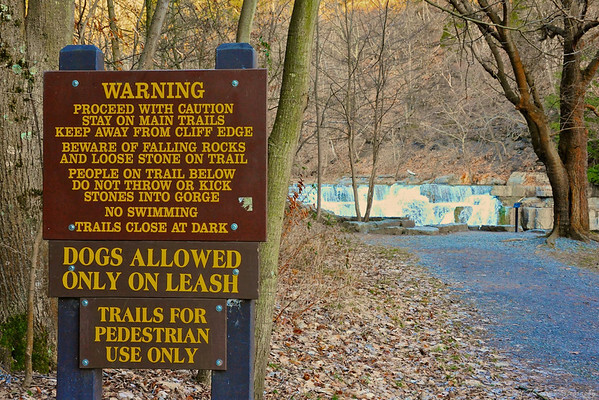 Warning sign at the start of the Gorge Trail in Taughannock Falls State Park near Ithaca, New York. Nikon D700/28-300VR, 1/60s, f/16, ISO 3600, EV 0, 45mm focal length. I hope New York state covered all their liabilities on the sign. In this photo, I tried to use the tree and the rocks on the talus hill to show distance up to the stone wall of the gorge and the ice formation hanging on the unseasonably warm day. Ice formation on the gorge wall in the Taughannock Falls State Park near Ithaca, New York. Nikon D700/28-300VR, 1/60s, f/16, ISO 5600, EV 0, 44mm focal length. This is close to the place I photographed ice boulders a little over a year ago. 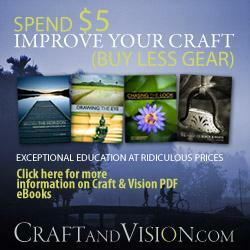 eBooks from Craft & Vision are only $5 and come in PDF and iPad formats. 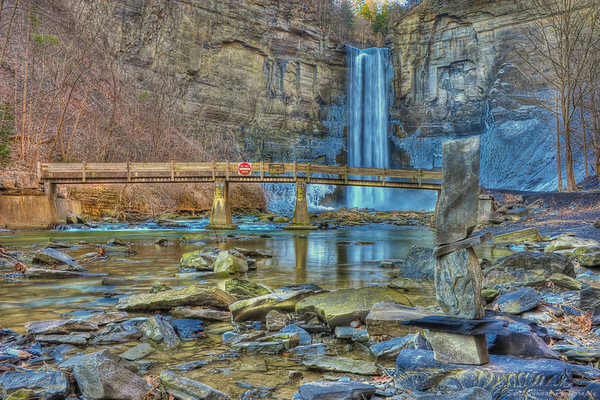 This entry was posted in Photography and tagged 28-300mm, bridge, david duchemin, ebook, ice, new york, nikon D700, rocks, sign, state park, stones, taughannock falls, trees, tripod, vr, warning, water, waterfall, winter. Bookmark the permalink. Great article Scott. All your pics illustrate the concept very well. I especially like the first one with the rock stack, bridge and falls. I am just finishing up David duChemin’s book “Photographically Speaking: A Deeper Look at Creating Stronger Images” which I would recommend. Now I to have to go look over the books at Craft and Vision. Scott, would you mind explaing WHY you’ve used such a high ISO setting in the last two pictures?? It looks like there was plenty of daylight for a lower setting (which probably would have prevented the whites from being blown). I try to keep my ISO as low as possible at all times, and only raise it when I absolutely have to. Not at all, the why is because I was shooting in Program mode and allowing auto-ISO to go as high as 6400 while keeping the shutter speed at 1/60s. It was not as bright in the wooded area as you might think. Thus, the waterfall and ice was too bright for the camera’s light range. I was concentrating on depth in these photos and the Nikon D700 can handle high ISO rather well. I do love the first image, and thanks for a review on this ebook. I read Within the Frame and learned a great deal from it.